Since soccer is about running and knowing that movement creates movement, a player should always be willing to run into positions which threaten the opponents’ goal, even when the odds are against him receiving the ball. He will then cause havoc for the defense which will make things easier for his team­mates. When attacking, running off the ball means getting into a position which enables the player on the ball to make the best pass possible in the situation. A player that wants to move well off the ball will be conscientious about his cardio training. A good exercise to encourage movement and cultivate the ability to lose opponents is ‘shadow movement’. You can practice this with two players – one player is followed by his partner, the defender. While moving forward at a jogging pace, the player in front suddenly stops, then moves or changes direction quickly in an attempt to get away from the defender. The defender should follow as closely as he can. This will also be excellent reflex training for the defender marking one particular opponent closely. Defenders like playing against teams that don’t move much. They are put under most pressure when movement takes place behind them. Ideally a defender wants to be able to see the ball and watch his immediate opponent at the same time. The art of positioning is to make the defender as uncomfortable as possible by work­ing on his back or blind side. Defenders detest being made to turn and run back towards their own goal. They are also under pressure when they allow their immediate opponent to turn and run at them with the ball. Now try an aggressive soccer drill which utilizes four players, one ball, and an area about 30 yards long and 10 yards wide. The four players form two pairs. One pair will be work­ing in direct opposition to each other and start in the middle. The other pair will split up and each player will wait on one end of the area and act as supporting players. The idea is for one player of the pair working in the middle to work the ball with the player on one end in order to play to the player ‘resting’ at the other end. His partner must mark him tight and try to win the ball so that he can then have pos­session and work the exercise himself. One minute will be enough time for a pair working really hard. It might take several attempts made before your players really get the idea, but the effort will be worthwhile. Your players will soon learn to position themselves diagonally from the supporting player to whom they’re passing. Encourage the defender to come in close by passing the ball to the player’s feet a couple of times before playing and sprinting on the blind side to collect the return through ball, then play it to the other player. Your player then moves quickly into a diagonal position ready to go again. If the opponent comes in really tight, he can look immediately for a direct ball on the back side of the marking player. If he doesn’t come in tight, then your player can turn and take him on. Timing is important. Your players need to keep one eye on the ball and one eye on their marker and the moment they know they can lose him they should try to get away. Then he’ll be in a position to steal a shot at goal if the ball is played to him, and the other defenders will be wondering where he came from. 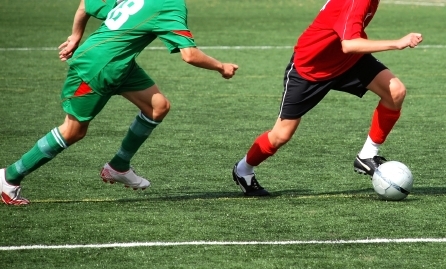 It’s unlikely that you’ll find players under-8 that have the feel for off-the-ball running. This is a skill that takes time to develop with experience. However, it won’t take as long as other skills. Teach your players to keep their heads in the game and constantly be thinking of great places on the field to run to. They need to know even without the ball they are in the game!